Scott Pack from the Friday Project recently sent me a review copy of their new book, 'A Gaijin's Guide to Japan'. A gaijin is an "outside country person", and the term is used of anyone born outside Japan, no matter how many years, or even decades, they've lived in the country. The book makes no pretense at providing an absolute understanding of Japan and is all the better for it. Instead it gives the experiences and enthusiasms of one gaijin who has married into a Japanese family. There are lots of personal anecdotes, many of which provide an insight into Japanese etiquette and faux-pas (with Stevens admitting some he has made himself). My favourite section was the discussion of what some people call Japlish. Rather than the mocking tone I've sometimes seen, Stevens talks fondly about Japanese English as a distinct dialect and claims that it needs to be incorrect: "Japanese English is Japanese English – it makes the product it's advertising seem 'cool', while also giving an assurance that it is, at heart Japanese. Perfect English would just make a product seem foreign". The book uses an A-Z format rather than a series of chapters focussing on different aspects. This means the book starts with Abe Sada and continues through a kaleidoscope of Japanese history, pop-culture and tradition, with the mundane and serious side-by-side. Stevens also takes his time over some of his favourite stories, such as that of the warrior monk Benkei or the filmmaker Beat Takeshi. A Gaijin's Guide to Japan is a fantasic, positive guide to Japan, and the writer's enthusiasm is infectious. I now want to visit Japan more than ever. Meanwhile, where can I find somewhere locally that sells Umeboshi? I don't know how many readers this weblog has in the Hastings area, but just in case: I'm reading at the opening night of Short Fuse Hastings on Sunday May 31st. The night starts at 8pm in The Rooms Cafe Bar in St. Leonards and costs £5. I like St. Leonards. Back in 1998 I lived in the Grand Hotel ("as seen on Channel 5's The Hotel Inspector"). St Leonards was a strange place, dominated by the impressive Marine Court; under the building nestled a Dr. Who shop, keeping the faith in the programme's wilderness years. I believe Iain Sinclair lived in Marine Court around the time I was in St Leonards – certainly I recognised some of the background characters in his novel 'Dining on Stones'. You can get a good idea of the town from the Lost Promenade's recent visit (see here and here). Anyway, if you're at the night, come and say hello. I've not decided what to read yet. I do have one story about St. Leonard's ('The Final Performance of the Puppy Dog Ballet') but I might ignore that in favour of something more substantial. Rosy Carrick is compere at Hammer&Tongue Brighton and Trailer Trash. I probably couldn't get away with putting on a spoken word night and not asking Rosy to perform, so it's fortunate she's as good as she is. Bill Jones is one of my favourite local writers. He's read at Sparks, Short Fuse Brighton and a previous incarnation of Telling Lies. His stories are funny and whimsical, and I'm looking forward to watching him again. We also have Chris Parkinson of the Young Hanoverians. Chris helps compere the incredible monthly Glue Gun '91 night at the Victory and recently won the monthly Hammer and Tongue Slam. His poems are funny and intelligent, yet slightly deranged. There will also be a musical interlude from the fantastic Madame's Butterflies. Featuring two uplifting arial singers, Madame's butterflies are "dazzling operatic cabaret". I'm also going to perform a couple of stories including one I've not written yet, but I'll talk about it nearer the time. Tickets for the night will be £4 on the door (details of how to book in advance will follow). We're starting at 8 with the main performances finishing around 9:30 – so if you've got work the next day you can make it home in good time. I'm currently planning a few things for those don't have a curfew and want to linger. This will be the first spoken word night with a director's cut. I also want to have a stall on the evening with books and pamphlets from local writers. Leave a comment below if you're interested and I'll get in touch. Is creative writing a pyramid scheme? It’s been an exciting couple of weeks but I’ve not been blogging as much as I should have done. The next few days are likely to see a succession of announcements as I catch up. Some exciting things are in the works. One thing I should have announced is my second EMLN blog post: Is Creative Writing a Pyramid Scheme? Some interesting follow-ups to Ian Jack’s article can be found here, here, here and here. There are also some thoughtful responses in the comments of my blog post which I hope to respond to later this week. Posted on May 17, 2009 Author James BurtCategories WritingLeave a comment on Is creative writing a pyramid scheme? Somehow two weeks have slipped by since I last posted. There are lots of things I need to write about, such as my next Literature Network blog post, Pictour, Penumbra's new issue and two readings I've got coming up in June. I also have a pile of links to post. Meanwhile here are some odds and ends I meant to post last week. At the end of April I read at Glue Gun '91. I had a good time reading and, being on early, could relax and enjoy the rest of the show – dying clowns, fake newspaper front pages, factsheets, the end of the world and a stunning set by AKDK. Glue gun '91 was incredible. The next episode is May 21st at the Victory (Life after man!) and AKDK are playing at the Hope the following night. The new Art Brut album, Art Brut vs Satan, is amazing. Sometimes I've played a game with people where we try and figure out what we could invent if we were sent back in time a thousand years or more. Life has become so abstracted that most of my skills and knowledge would be useless without an elaborate civilisation to back them up. This poster will come in useful. 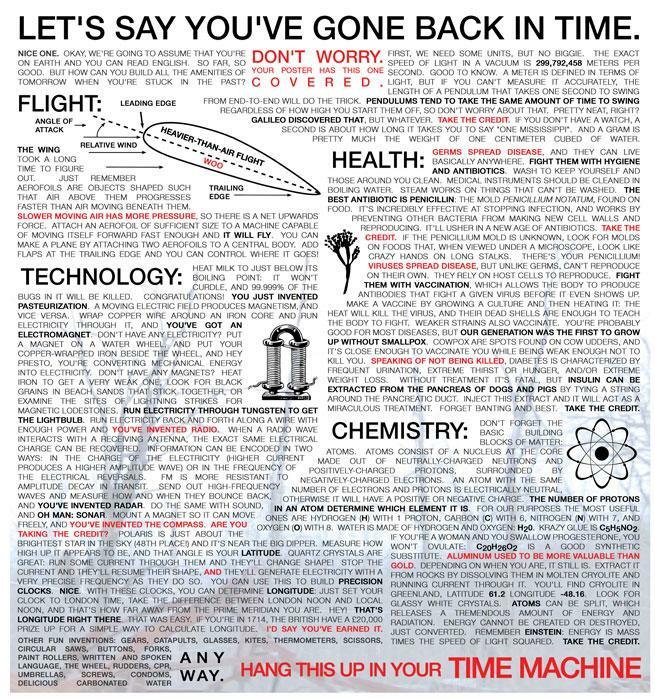 I'd love to know who made it – maybe time-travellers from our own future? My run of running misfortune continued last week when I feel over, banging up my knee and hand pretty badly. I despair of getting back in shape again. Going to get an early night tonight. I'm very excited about tomorrow as I'm finally going to watch Synecdoche NY.